Mill Art Center & Gallery provides an environment in which the community can express and develop their artistic abilities through instruction, observation and interaction with professional artists. Our unique blend of classroom studios and professional gallery exhibition space encourages students to immerse themselves in art, with inspiration from instructors and the art that surrounds them. Our small class sizes ensure that each student gets plenty of one on one time in every class. Children and teen classes follow the public school calendar. Arrangements may be made with specific instructors for make-up classes. Gift certificates for art classes and art purchases are available. This workshop is ideal for anyone who loves painting, drawing and the freedom to explore new techniques. This workshop will introduce a plethora of techniques that can be used in monoprinting. Additionally, through the use of rollers, brushes, palette knives and found materials, you will have the opportunity to create textures that enhance the atmosphere and mood of your work by creating multiple unique works or monoprints. There will be an introduction on monoprinting and renown monoprint printmakers to inspire and inform your current art practice. Feel free to bring current work you may wish to test with monoprinting. Open to all levels of experience. There are many ways in which to transfer images using encaustic wax medium as the substrate. In this workshop we will focus on transferring printed images from your personal photographs or graphics. In addition to learning basic techniques of encapsulating these images you will learn ways in which to enhance them with the use of encaustic paint, pigment sticks and pastel applications. All materials will be provided. Collage helps us tap into an inner voice that often times we don’t pay attention to. Using wax as the binder adds to the depth of the encapsulated thoughts and ideas. In this workshop you will learn the basic application techniques of working with encaustic wax medium to assemble your collage. You will also learn glazing techniques and various ways in which you can enhance the surface of the wax layers. All materials will be provided however, participants are encouraged to bring items for collage. Stamps, thin papers, newsprint, threads, pressed plants, etc. are some suggestions. There will be plenty of materials available to work from. This workshop takes place in Kathryn Bevier’s studio located on the third floor of The Lower Mill Building. Class Dates :: new dates to be posted soon. Using wax based paints to create prints is such a great way to explore your visual language. The prints you produce in this workshop are works of art and can be framed or used as mixed media elements for future work. You will learn essential information on the printing process with encaustic paints, from set-up, free form printing, how to work from registration for mono-type printing, as well as a wide array of application techniques. You will also learn how the different pigments and papers behave for a better understanding on how to achieve the results you desire. All materials are included in the cost of this class. This workshop takes place in Kathryn Bevier’s studio located on the third floor of The Lower Mill Building. The encaustic medium offers a fantastic array of opportunities to work with all sorts of mixed media products. From inks to pastels, onto pigment sticks and more, you will be amazed at how versatile this medium is and the interesting effects you can achieve. This is a highly exploratory workshop where the focus will be on opening up to the spontaneous nature of creativity. Please join Kathryn in this workshop where you will gain a wealth of knowledge on enhancing your understanding of working with encaustic paints in an archival way. Creating collage elements In this workshop we will create painted papers to be used in abstract compositions. Participants will learn a variety of techniques to create unique and beautiful collage elements using acrylic paint and mark making materials on an assortment of papers. Experimentation and exploration will be encouraged as we create a series of small layered abstract paintings. Students will go home with a stash of collage papers for future projects. All materials will be provided however, participants have the option of bringing items for collage. Suggestions are: laser prints of your own photographs or found papers (do not bring originals), magazine, dictionary or encyclopedia pages. If you bring prints of photographs I suggest you select images containing pattern, color, shape or texture to be used as abstract elements (as opposed to representational photographs of people or animals). There will be plenty of materials available to work from. Karen Frutiger is a local mixed media artist. She has participated in numerous exhibitions in the greater Rochester area. Her work can be seen on the website www.karenwfrutiger.com or instagram karenfrutigerart. Students will enhance their understanding of printmaking with new techniques and procedures designed to build on any previous printmaking experience. In this class students will be introduced to linocut, chine colle and mono printing, with the ability to explore their own printmaking ideas. Open to all levels. Bring a sketchbook. Are you fascinated by the look and feel of art created with wax? Learning encaustic techniques is equally intriguing. In this workshop you will learn the fundamental principles of working with pigmented wax to create your own encaustic art. This is the perfect workshop to get you primed for all other workshops held in Kathryn Bevier’s ArtWorks Studio located on the third floor of The Lower Mill. In order to reserve a space in a class or workshop at The Mill Art Center you must pay in full. You may do this by registering online or by mailing us a check made out to the Mill Art Center. Our mailing address is 61 N. Main St Honeoye Falls, NY 14472. Our cancellation policy is such that a 15% fee will be deducted from any refund given up to one week prior to the start of the class or workshop. NO Refund will be given for a cancellation made the week prior to the start of the class or workshop, unless your space can be filled. in the event that you have registered for a class or workshop and it is cancelled, you will be reimbursed fully. Known for her exquisite colored pencil drawings, Sari joins The Mill Art Center to share her talent and extensive knowledge of this medium. Sari will demonstrate how to use colored pencils to their fullest potential. You will be familiarized with the latest products and be able to compare various techniques first hand. Working from your photo, you will get a great start on your drawing, with plenty of instruction as the day progresses. Depending on the size of your work, you may need to finish at home, and Sari will leave you with specific directions on finishing touches. Join us in this all day workshop where you will have the opportunity to learn from Sari Gaby, one of Rochester’s most well respected portraiture artist. Sari will demonstrate and lecture in the morning from a live model. 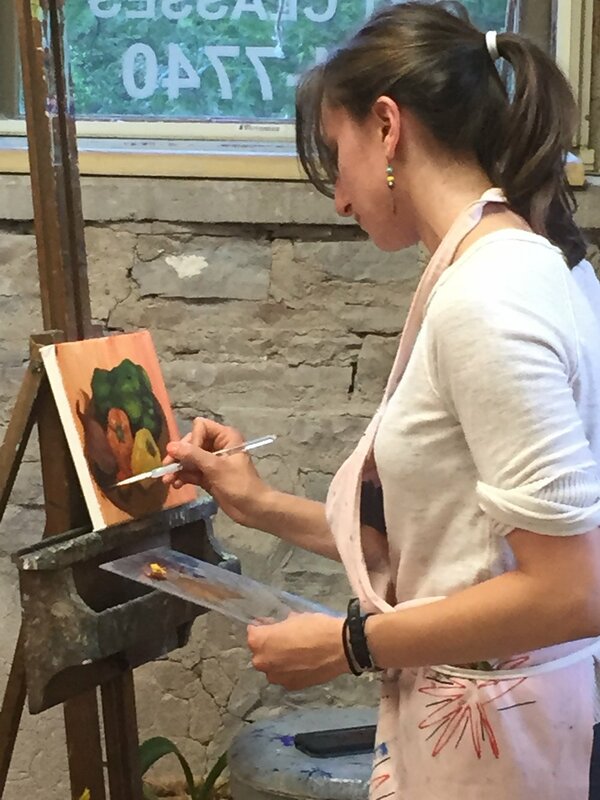 After a short lunch, you will be working along with instruction at your easel, from a live model. Sari has a fun and accurate approach to getting a likeness in your portraits, even if you are a beginner, you will gain invaluable knowledge. For those who wish to learn a new approach, or hone your skills in portraiture, this workshop is ideal. Observational drawing can be learned at any age, and anyone can draw better through practice. Beginning Drawing will give students the knowledge of the materials and methods they need to draw effectively and expressively. Drawing from life, and demonstrating progress in informal and individual critiques, students will build comfort with the materials and confidence within themselves. This class will take place over six classes, one class per week, for six weeks. Class Dates :: new dates to be determined - Thursday evenings from 6pm to 8:30pm.